The cramped, manic streets of Hanoi’s Old Quarter are infamously difficult to navigate. Street names may change every block or two and roads twist and turn, leading you in circles. After spending thirty minutes trying to orient myself with the tiny map in my Lonely Planet guidebook, I decided to try something new. I get lost easily –which is half the fun of travel– but this time, it really wasn’t my fault. A typo in the guidebook’s map was telling me I was north of Hoan Kiem Lake, when I was actually to the east. As a result, I couldn’t seem to find a street corner where the map in any way matched reality. 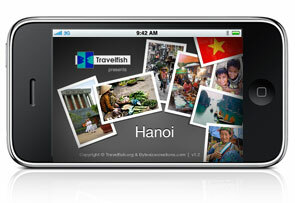 So, I found a wi-fi hotspot, digitally plunked down my $5.99 and soon had a new toy: the Hanoi app from Travelfish. For those unfamiliar with the Travelfish website, it’s a great resource for traveling anywhere in SE Asia with helpful, up-to-date articles, PDF Guidebooks, and active, helpful forums. It’s great for planning a trip, but not too handy when you’re actually walking down the street. I was very impressed with the quality, ease-of-use, and amount of helpful information. I’d never used an iPhone guide and I have to say I was very impressed with the quality, ease-of-use, and amount of helpful information. The app is broken into eight main sections: Background, Sleep, Eat & Meet, See & Do, Transport, Walking Tours, Photos, and Maps. The Background section is surprisingly deep and useful. I hardly gave it a glance for days and was floored at the amount of helpful tips and info I found there. I wish I’d looked at it first. It covers history, basic info on both Vietnam and Hanoi, tips for enjoying your trip, food and drink, shopping, planning the ever-popular Ha Long Bay tour, and more. And, it’s all well-written in easily-digested chunks and easily-navigated. I found the selection of hotels to be about the same as Lonely Planets’ in number (but more detailed), with categories broken into budget, mid-range, and high-end. Each location features a short review, a photo of the hotel (very handy in densely-packed streets), and a link that takes you to the map. The Eat & Meet section works the same way and is broken down by type: Vietnamese, International, and so on. See & Do covers about twenty major tourist attractions in the city –with basic photos, descriptions, and entry costs– and the Walking Tours section offers three different tours, with detailed itineraries and special maps with the route highlighted. I followed along on the Old Quarter tour and had a great time. Transport covers both getting around Hanoi and getting into Vietnam itself, with helpful information on all of the major border crossings. One quibble: the Chinese border section recommends that you check with the embassy in Hanoi, but doesn’t provide a link. 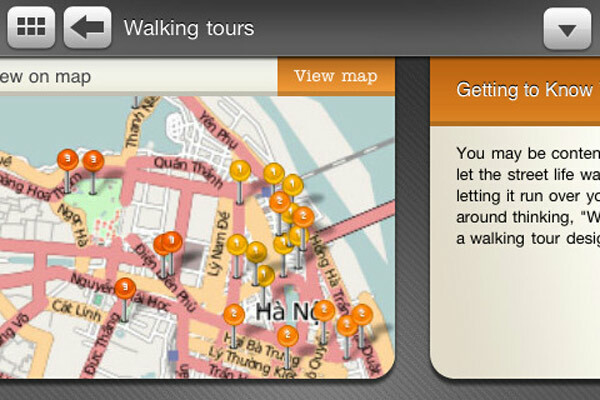 The info, with contact info and web addresses, is found in the About Hanoi section — a pin on the map would be even more helpful. The Maps section is easily the most useful part of the app — being able to zoom in and out of an interactive map while the app highlighted my location on the iPhone made my real-world navigation fast and easy. It would sometimes take 20-30 seconds for my location to show up, but I suspect that’s because I have an older iPhone that doesn’t offer true GPS. The map has a filter function where you can have it display, say, only hotels and restaurants. 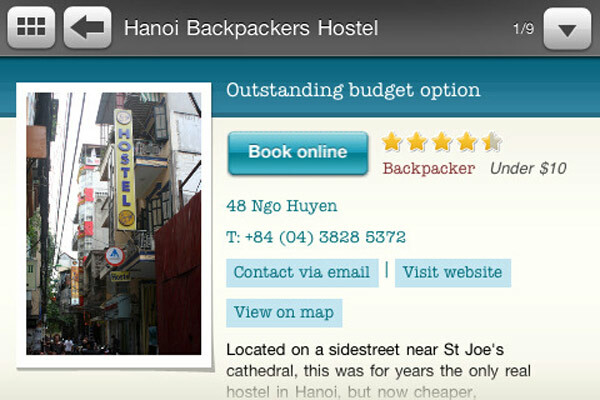 This allowed me to easily locate a cheap, backpacker hotel hidden far down a crooked alley. After I checked in, I pulled up the map and found that I was only a couple of blocks away from Finnegan’s Irish Pub and was soon enjoying an over-priced beer and a much-desired shepherd’s pie. I have to say I’m very happy with my purchase — the map feature with hotels and cafes is worth the money all on it’s own. When you launch the Map, it resets all of the filters to “on” and I found myself having to turn them all off again to be able to see what I was looking for — but that’s my main complaint and it’s a weak one. All in all, this app gets a hearty thumbs-up from me. I look forward to the day when I can download Travelfish: Vietnam and leave the book behind. For that to happen, we’ll also need significantly-better battery life, since your guide dies when the battery does. Thanks for the great writeup on the app — glad to hear it helped you find an overpriced pint ;-) Take your point on the map filter issue, that is something we’ll work to address in future release as we’ve a range of features we’re looking at building in through the second half of this year. Technical stuff usually leaves me very unexcited, so I am definitely not a gadget person. However, you just might have triggered an interest with this post as I too am exceedingly good at getting lost, even when I have been somewhere before. Its a girl thing, no scrub that, its just a me thing! So thanks Wes this has made me think about updating my kit, I will be exploring the possibility of binning my ancient Sony Ericsson for something a bit more *useful* and perhaps a tad more glamorous in the near future! I have to say that I’ve found the iPhone to be a very handy travel tool. The Hanoi app was icing on the cake. Thanx for the review. Another valuable tool for the next trip to Vietnam. I used the Travelfish Bali app last year and it was fantastic.